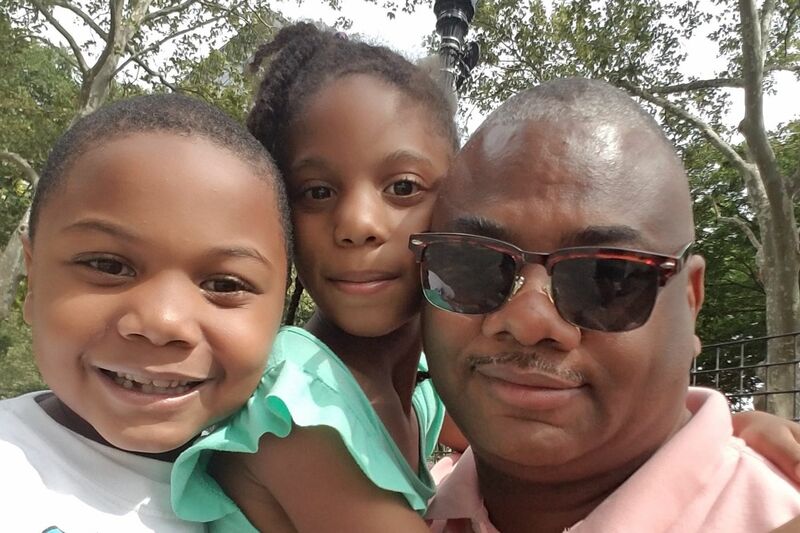 Reuben Jones, executive director of Frontline Dads, with his 8-year-old son Langston and his 10-year-old daughter Raegan. When an unarmed black American dies at the hands of police, the emotional impact reverberates so widely that black Americans who don't even know the victim report distress, anxiety and depression, creating a national mental health burden nearly comparable to the stress caused by a chronic illness like diabetes, a new study has found. Researchers from the University of Pennsylvania, Boston University, and Harvard University analyzed data from a nationally representative survey covering more than 100,000 Americans for the study, published Thursday in the Lancet. They found that on average, police killings of unarmed black Americans contribute nearly two additional days a year in which a black person suffers some mental health toll. The study found no such effect on the mental health of white Americans, nor did black Americans report this kind of distress over police killings of armed black suspects. "I wasn't so much surprised by the findings as I was saddened," said Atheendar Venkataramani, a study author and assistant professor of health policy at Penn's Perelman School of Medicine. Hearing of an unarmed person dying in a police shooting, he said, may signal to others that they, too, could be vulnerable to violence through no fault of their own. "Events that communicate to people that maybe they are worth less or their lives are not valued can influence people's health," Venkataramani said. For Reuben Jones, a Philadelphia native and executive director of the nonprofit Frontline Dads, the findings quantify what he's seen throughout his life. "Police killings remind you of your own mortality," he said. "Even the most simple police stops can end your life." As the father of 8- and 11-year-old sons, the trauma of a police killing hits him on a level he describes as "debilitating." "If these two harmless young people have an encounter with the police, I realistically don't know how it would turn out," he said. That level of fear and uncertainty affects every aspect of life, Jones said. It's why black men make sure to kiss their families before leaving the house. It's why some youth see little value in education. "There's no living for tomorrow," Jones said. Dennis Plowden Jr. with his mother, Chinita McCoy. In the United States, an unarmed black person is three times more likely to be shot by police than an unarmed white person, and in the last three years, more than 70 unarmed black people have been killed by police, according to a Washington Post database that tracks fatal shootings. These include cases that garnered national attention, like those of Philando Castile in Minnesota and Walter Scott in South Carolina. But there are also cases that hit closer to home: Dennis Plowden Jr. was fatally shot by an officer in Philadelphia in December and 17-year-old Antwon Rose was shot and killed in East Pittsburgh this week. The relentless nature of these incidents prompted Venkataramani and his coauthors to examine their effect on mental health. "We were hearing from friends and from people on social media that they could not sleep," he said. "They were talking about anxiety and feeling depressed." To quantify the effect, the researchers looked at responses from a telephone survey of adults, who were asked about their mental health in the last 30 days. Combining this information with data on police killings from the Mapping Police Violence database, they were able to compare the self-reported mental health of those surveyed before a police killing in their state with those surveyed afterward. Though the study looked only at shootings within one's own state, authors said news of shootings elsewhere likely contributes to the mental health impact. Venkataramani said another reason the findings likely underestimate the mental health burden of black Americans is that black people face multiple forms of racism every day. Bias in the criminal justice system and housing and employment discrimination are also important factors, he said. Previous research has found that the chronic stress caused by experiences of racism can impact mental and physical health in myriad ways from higher rates of hypertension to increased incidence of breast cancer. "It's not just one incident, like a police killing," said Lisa Christian, director of community services at the Anti-Violence Partnership of Philadelphia. "You're talking about a cumulative effect of how a variety of these events is impacting communities." Many compounding factors have existed in neighborhoods for years, like poor access to healthy food or medical care, said Phillip DeMara, director of Philadelphia's Network of Neighbors program – which trains residents in trauma response and psychological first aid to provide support after a tragedy occurs. How does mental stress harm physical health? For instance, if a person overeats when stressed, and they're surrounded by unhealthy food choices, that can lead to obesity, which is linked with diseases from diabetes and hypertension to cancer. "Over generations, that has a significant impact," DeMara added. While the new study focused on black adults, previous research has shown that violence can affect children throughout a community, too. Katherine Streit of the Center for Grieving Children, which runs grief groups in Philadelphia schools, said she's often heard kids after a shooting express their own distress. "That was a good kid," a child might say. "He didn't do anything wrong. If it happened to him, what's to say it won't happen to me?" "That is a very difficult reality to grapple with at such a young age," Streit said. It can lead to increased anxiety and depression in black youth — a problem that is often compounded by the fact that mental illness can manifest differently in black adolescents than their white peers. As a result, black youths often go undiagnosed and untreated, and their mental health continues to suffer, potentially leading to dropping out of school, poor physical health, and substance abuse. Any one of those consequences can extend the impact of early trauma into adulthood. "Until we take the action to hold police accountable for taking the lives of black people, we'll continue to see the accumulation of this trauma," Jones, of Frontline Dads, said. "It's not going to go away. It doesn't magically disappear."